In today’s health conscious society, many consumers have became avid label readers of the products they purchase, especially food products. For someone suffering from high cholesterol, high blood pressure or other health problems, knowing which products to avoid or limit can help restore them to a better state of health. But, simply checking a label for fat or sodium content may not be enough, you may also want to check to see if the product contains ground up bugs! Although it is not widely known, companies have been using a dye made from insects in many different types of products, including food, for many years. These insects, Dactylopius coccus, live on cacti and are native to South and North America. 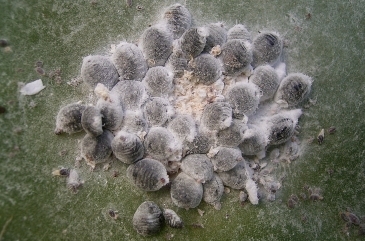 Commonly known as cochineal, these scale insects are less than one-quarter inch long and have flat, oval shaped bodies. The dye is the result of the carminic acid that is produced by the insect as a natural repellent for other insect predators. 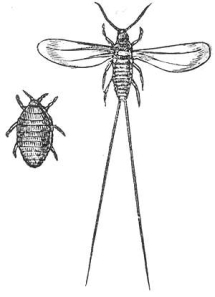 It is derived from the female cochineal and from the eggs. Cochineal dye has ancient origins, being used by both the Mayans and the Aztecs as a textile dye as far back as the 10th century. 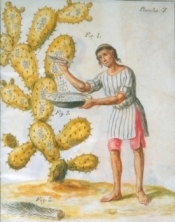 By the 17th century, cochineal was exported around the world and became a commodity that was considered as valuable as silver and gold. The deep, vibrant colored textiles produced by the dye were even highly sought after by royalty. But, with the introduction of artificial dyes that were easier and less expensive to produce, the demand for cochineal dye fell sharply. However, the industry is thriving again after the discovery of the carcinogenic properties found in many of the artificial dyes. While the thought of crushed bugs adding color to the foods we eat may not be pleasant, it could be considered a better alternative than artificial dyes. Synthetic dyes like Red No. 40 and Red No. 2 are derived from byproducts of petroleum and coal and pose a much more serious health risk than natural dye derived from crushed bugs. In 1998, a consumer advocacy group, The Center for Science in Public Interest (CSPI), urged the Food and Drug Administration to either ban the dye or to pass regulation requiring companies to list cochineal dye in the ingredient section of the label. After more than a decade, the FDA finally passed a regulation that required companies to include the dye by name on the ingredient list of all food and cosmetic products containing cochineal in 2009. And, in 2006 the FDA announced they would do a separate review of ingredient lists on prescription drugs that contain dyes derived from cochineal. Insect Food Dyes – Health Risks? While the idea of crushed bugs in your favorite foods and drinks may not be appetizing, the bigger concern for many is the health risks. May Vegetarians And Vegans Consume Insects? Along with a large number of general consumers, some people are opposed to cochineal food colorants due to lifestyle choices or religious beliefs. Many vegetarians and vegans consider the additive to be “non-vegan” because it is derived from insects. And, while some suppliers literally claim to have a “Kosher Certificate”, a colorant made from insects simply cannot be kosher! Over the last few years, grievances from these communities have helped to bring this subject to the public’s attention. How Wide Spread Are Cochineal Dyes In Products We Use Everyday? So, how wide spread is the use of cochineal dyes in the products we use everyday? As of now there isn’t a complete list of every product that uses this natural dye, but it’s sure to reach into the thousands. Not only is it used in the food industry, it’s also used in the cosmetic and pharmaceutical industries. Pharmaceutical companies use the dye to color everything from pills to ointments. And, cosmetic companies use it in a variety of products including lipsticks, blushes, rouge and face powder. It can even be found in body care products such as shampoo, soap and lotions. Even with it’s use in other industries, the main industries consumers are concerned about is it’s use in the food industry. It is fairly certain that at one time or another, maybe even on a regular basis, each and every consumer has eaten products containing dye made from crushed bugs. It’s in such a wide range of food products that there is little chance of avoiding every food that contains cochineal. Two of the most prominent yogurt manufactures, Yoplait and Dannon, both use cochineal or carmine in their products. It can be found in chewing gum, candy, popsicles and ice cream. Some manufacturers add it to frozen meat and fish and it can even be found in sausage. Jellies, jams, marmalades, syrups, canned fruits, ketchup, canned soups, gelatin, cake icings, dry mixes, cereal and bakery products are among the limitless number of items whose colors are enhanced with cochineal. Foods aren’t the only products that contain this controversial dye, it is also used in many drinks. Any pre-made drink or powdered drink mix that is red almost certainly contains cochineal. These include milk based beverages, energy drinks, soft drinks, fruit drinks and even some alcoholic drinks. But, while the most common color of products containing cochineal is red, it can also be different shades of pinks or purple depending on how the colorant is processed. Some companies like Starbucks have already stopped using cochineal, while other like Dannon have announced they will continue to use the coloring in their products. The bottom line is that it is up to you as a consumer to decide if you would prefer to use products with an insect based dye or with synthetic dyes. “You now have another good reason to read ingredient labels and weigh the options.